-The stunning brightness can up to 8000 lumens. -The head of the lamp is 90°adjustable for oriented lighting. the Center bulbs to zoom in or zoom out . 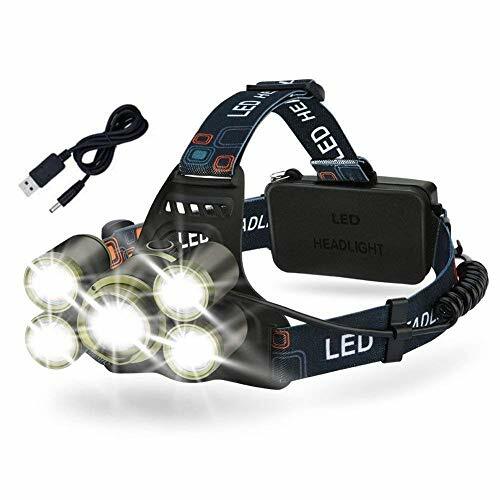 ★4 Modes LED Head Torch：There are 5 heads and 7 LEDs for this LED Headlamp. 3 * XML T6 and 4 * XPE with 4 Working Modes. Mode 1, main 3 x T6 light up; Mode 2, the side 4 x XPE light up; Mode 3, all light up; Mode 4, all strobe. And red light on the back for warning runners or cars in the dark. ★USB Rechargeable: The head torch is charged by USB cord and there are 2pcs 18650 rechargeable batteries included. Working time is 4-6 hours under full charge. There is a indicator light on the charging wire, if the indicator is red, it is charging; if the indicator turns green, it is fully charged. ★IP65 Waterproof: The 5 led headlamp is using aluminum headlamps and IP65 waterproof performance, the led headlight is waterproof in rainy day. It's suitable for camping, climbing, hiking, fishing, spelunking, adventure and so on. But remember don't put it stay in the water. It is not a diving headlight to work under water. ★Zoom-able & 90°Rotation: The led zoomable headlamp is Rotation focus up to 90°and zoom-able. It enables you to point your light up to 90 degrees in the direction you want and adjust the focus. The view angle of the led headlamp headlight is adjustable, so you won't be tired when you with this headlamp. ★After-sales Service: With a little adjustment to the headband, you should be able to tailor this rechargeable headlamp to any member who joins in your outdoor (or indoor!) adventures no matter he has a big head or a small head. Quality problems occur within one year replacement, lifetime warranty, if you're not completely satisfied, then CONTACT US and we will give you a 100% refund within 30 days of purchase. It is our intention to offer the BEST customer service on Amazon. If you have any questions about this product by EECOO, contact us by completing and submitting the form below. If you are looking for a specif part number, please include it with your message.